You no longer have to suffer with the embarrassment of unsightly and unhealthy silver/mercury fillings or metal margins and blue gums from old crowns or the discomfort of sensitive teeth. Did you know that sensitivity to cold food or drinks, sweets, acidic foods, or just chewing can be a sign that an old silver filling is breaking down. After just a few years bacteria can start to seep into the tiny open area between a silver filling and your tooth. 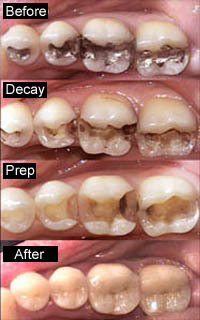 After several years deep decay can form and cause problems starting with sensitivity and eventually lead to a toothache. These pictures will show just how extensive the problems can be. The miracle of adhesive dentistry allows us to replace dark, leaking fillings and old, ugly crowns with space-age, state-of-the-art, tooth-colored resin or porcelain adhesive restorations.